Hair transplant cost is determined by many factors. Each case is different. In order to determine the specific cost for your hair restoration we encourage you to schedule a consultation today. The area that needs to be covered - hair line, crown, mid scalp, scar repair, etc. We at Alvi Armani pride ourselves not only on providing the outstanding results in hair transplantation, but also on our exemplary customer service and willingness to go above and beyond. Ensuring by any means necessary that you are treated the way you should be, as a V.I.P. Of course hair transplants work! Please see our Hair Transplant Photos page. The principle is very simple. The genetic makeup of hair on the sides and back of the head is resistant to genetic pattern baldness. This makes it possible for the hair that you have on the sides and back of the head to be relocated to the area where it is falling. This new relocated natural hair will stay and continue growing. You should also know that hair transplants have been around in various formats since the beginning of the 1900’s. Hair transplant is commonly used to treat cases of hereditary baldness but not alopecia areata or cases of trichotillomania. The fact that a person keeps hair on the sides and back of the head does not mean it is right to do a hair transplant. Extensive communication is required for the patient to be aware of what can and cannot be achieved with a hair transplant. The doctor must understand what the expectations of the patient. Often the hair transplant is a compromise between the doctor and the patient after a long dialogue. The art of a hair transplant is not just the technical skill of the doctor, but also the doctor’s natural talent to be able to properly design the frontal hair line for each patient according to their features. A doctor with this ability can create a head of hair with a natural look. This is the difference between a regular hair transplant and a natural, undetectable, superb hair transplant. Usually a procedure of 2500 to 3500 follicular units can be done in one day. If you need a procedure with more follicular unit grafts it can be performed in two consecutive days. There are only minor annoyances. The procedure is performed under local anesthesia and the patient is conscious throughout the process. There is little need for further medication for pain and requires little more than a half painkiller for the first night. This is the advantage of the new Alvi Armani Technique which uses FUE (Follicular Unit Extraction) Hair Transplants to obtain the follicular units from the donor hair. This is a common term referring to hair transplant sessions where there are more than 3000 hair implants extracted and implanted. The method involves placing a large number of implants in a single session for maximum density and coverage of the balding areas without the need of performing several separate processes. It is the art of placing follicular units close enough to each other to ensure a natural and good density in a single procedure. This in particular refers to the hairline design without large gaps between each hair. Low density (as in hairs per square centimeters) hair grafting would require a second or third procedure after to improve the natural density - if not done with high density in first instance. The amount of follicular units placed per square centimeter depends on certain factors like hair characteristics, the quality of the hair bulb, ethnicity, hair color, hair density and balding area to be implanted. The high-density implant is a great technique to place follicular units close to each other without compromising their growth, placement angle and the diameter of the means employed influence the outcome. This is a term used to describe the temporary loss of existing hair found in the surrounding area to where the hair has been implanted (i.e. : hairs that surround the recipient/bald area) This phenomenon is temporary and is the result of the stress experienced by the follicle when incisions are made nearby to implant new hair. This is similar to when a person gets a cut in the arm. The hairs in the surrounding area of the cut will temporarily fall off. These hairs will immediately start producing a new hair and the hairs will regrow. What is transected follicular growth rate? The hair transection is the loss of hair when removed from the donor area. This occurs from damage to the follicular units in the donor area during the extraction process. An acceptable level of transection is around 5-7%. The growth rate is the percentage of follicular units grown once placed in the recipient/balding area. The growth of the follicular units implanted in the balding area will be compromised if the follicular unit is not placed correctly, not properly maintained until the time of implantation, or is damaged during placement. Other external factors that affect the growth rate is the degree of compliance by the patient with the post-operative instructions. Failure to follow post-operative instructions by the patient will affect hair growth. An acceptable growth rate is around the 94-98 %. Can I undergo more than a hair transplant? The potential number of implants that can be extracted from a person is around 8000 grafts or about 16,000 hairs. It is not possible nor ethically recommended transplanting all in one session. Several sessions – usually of 2500 grafts to 3500 grafts – are performed to distribute the extraction in the recipient area in a strategic manner so as to achieve the best results for the patient in the mid and long term. Factors such as age, the Alvi Armani Hair Loss Scale, and the progression of hair loss help answer this question. In most cases the person receives more than one procedure, although it may take many years between each other. The need for additional procedures will be determined by the quality of the hair transplant performed. When the procedure is of higher quality the longer it will last and the longer the time period necessary in between hair transplants. After the hairs are transplanted it takes a week for the skin to settle as well as the surrounding cardiovascular system. Hairs will begin to grow during the first month and then drop out without leaving visible signs of hair transplant. It is normal for 100% of transplanted hairs to fall during the first month post procedure. The transplanted follicles go into rest for about 3 or 4 months until growth resumes. Then the hairs start growing normally. Hairs grow at a rate of 10% of the number of transplanted hairs per month from the third or fourth month post procedure. At 12 months the hair growth reaches 90% growth, while the remaining 10% will do so in the next six months. It may take up to a year and a half to obtain a mature hair growth at which point you can appreciate the final results. No. The FUE hair transplant method is applicable to any person of both sexes and all ages. It is said that for young person there are other methods that may work, but the reality is that beyond the age of the patient each case has different features, thus each diagnosis also varies. Remember also that hair transplants are not necessary in all cases. Hair transplantation is not about age but about confidence, vision and less excitingly supply and demand. If the supply of grafts from your donor region is sufficient to meet the demand created by your current expectation and future hair loss then you are a candidate irrespective of age. If hair loss is affecting your confidence, we will be there to support you and create a vision to strategize for your current hair loss and for any future loss to ensure we have sufficient donor supply for any future restoration needed. An individual consult with the Alvi Armani hair transplant doctor is necessary. Do all clinics offer this FUE hair transplant extraction method? What is the most convenient? The most common follicle extraction method is the strip method - also called FUSS or FIT. This is still practiced although it yields a high percentage of patients dissatisfied with the results. Alvi Armani Clinics - market leaders in the FUE technique - have adopted the FUE method exclusively since 2008 for its effectiveness, practicality, ease for the patient, and above all for the best results obtained. What is the FUE method and what is the difference with other techniques? The method FUE hair transplant extraction method is the removal of follicular units individually through the use of a special surgical tool from the donor area of the patient. The strip or FUSS (Follicular Unit Strip Surgery) or FIT (Follicular Unit Transplant) extraction methods used by other clinics involves removing a strip of skin from the scalp. It uses a scalpel, pulling the scalp, and with subsequent suturing. The result of this strip method is that it leaves a large horizontal scar in the middle of the back of the head. The method FUE hair transplant is minimally invasive because it requires no cutting or sutures. In contrast, the strip technique uses a scalpel to produce a long and deep cut to extract the skin with the follicles. The FUE hair transplant extraction method is characterized by a much faster healing relative to the strip extraction method. Healing with the strip technique is slower due to the large incision. With the FUE extraction method often patients do not experience pain. The area heals very quickly and the risk of infection is very low. The strip technique usually is painful and recovery takes at least one month. Infection risk is very high. Yes, the FUE extraction method is notable for having a larger donor area, the neck and sides of the head. There is also the possibility of extracting body hair from the chest and legs. The strip extraction technique is more limited as it only uses the back of the head as donor area. It cannot access other areas. Does the FUE hair transplant extraction method have any limitations? No. There is no pulling or stretching the scalp in the Follicular Unit Extraction method (FUE). The strip technique has limitations because of lack of scalp laxity produced by the extraction of sections of skin from the scalp. What is the advantage of selecting the follicles? The method allows selection of follicles one by one. Choosing the necessary follicles is important based on where they will be placed. The strip technique does not allow selection of follicles because you get a complete strip of skin with hair which has a pre-determined number of follicular units. It can never really match what is needed for the recipient area. What happens if I already received a strip / FUT / FIT / FUSS hair transplant? 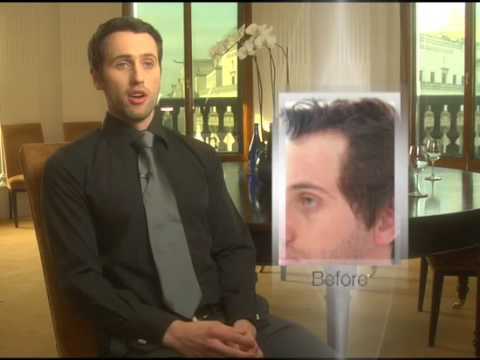 The FUE hair transplant method allows restoration of the scars caused by the strip technique. Can I get more follicles extracted after having received a strip procedure? Yes, the FUE hair restoration method has the ability to get more follicles when it is no longer possible with the strip technique. This is provided the donor area still has hairs to extract. Hair transplantation, when done right, can be so natural that even your hair stylist will not know that you've had it done. The skill and techniques of hair transplant surgeons does vary widely, as do their results. It's important to choose the right procedure and the right clinic to assure that you will get completely natural results. It is also important to do the transplant right the first time and avoid having to undergo a repair where the donor hair is already depleted. Can you repair older plug-like transplants? New technology has made possible for a vast improvement in the way older hair transplants appear. Because of the plug-like quality of older hair transplants, a softer fill-in is required to recreate a more natural appearance. With follicular unit grafting, we can create a more natural appearance in just one procedure. This will hide your old plug/doll-head hair transplant. Do you do eyebrow hair transplant? How successful are eyebrow transplants and are there any downsides? Eyebrow transplantation can successfully achieve an increase in both density and coverage. Typically this is achieved with a single procedure. You are able to return home the same day. The only upkeep to the procedure is the need to trim the hairs once or twice per month. Yes. An eyelash hair transplant is a very delicate procedure that requires extreme hand skills. Each case is evaluated by our Alvi Armani surgeons individually. Yes you will be awake the entire time – watching TV, movies, or listening to music. Some patients simply chose to relax or even take a nap. We use local anesthesia (numbing medicine) in the donor area to obtain the grafts and in the recipient area to implant the grafts and perform the procedure. Alvi Armani offers two types of procedure - a Regular session where the head is shaved completely, and an Executive Non-Shaved Session where only a small non visible area of the back of the head is shaved. There are two components to a procedure; the extraction of grafts (via the FUE technique) and the implantation of grafts. The non-shave Executive Session is more time intensive due to the added intricacy of extraction and implantation. We can expect the same outcome from, however the Executive Non-Shaved procedures tend to be smaller in the number of grafts due to the limited area from where to extract grafts. Many business men and celebrity clients in the spotlight opt for an Executive Non-Shaved Session as it is easier to conceal the procedure post operatively. A shaved session is less time and labor-intensive, can yield more grafts and is thus relatively cheaper as a result. Each method of hair transplantation has different advantages. Why do you not have a clinic in London, New York etc.? The skill and dedication required to create the Alvi Armani hair transplant results are not easily replicable. A clinic with multiple locations will find it more difficult to monitor and control service levels and outcomes. Alvi Armani considers growth to be about improving our technology, service and results and not just growing our number of physical locations. Alvi Armani clinics are opened regionally only when the right team with the right talent and commitment is found locally. A hair transplant is an important decision and the location of the clinic is of secondary importance compared with the result and outcome which you can wear proudly for life. In today’s world patients travel across the globe to get the best hair transplants with the best hair transplant doctors. Minoxidil has been found to be an effective drug for promoting new hair growth and slow further hair loss in both men and women suffering from pattern hair loss. While the actual scientific reasons behind Minoxidil's effectiveness require further study, many people have found it to be a safe and relatively easy method of addressing their hair loss. Studies have shown that more than half of men who used the 5% Minoxidil solution saw improvement in the frontal scalp region over 48 weeks, while more than 40% saw improvements using the 2% Minoxidil solution. The active ingredient is Minoxidil which is a sold in various strengths depending on the country. In the United States, the 2% and 5% Minoxidil solutions are available over the counter for both men and women. Used topically, Minoxidil in its spray or mousse formats must be applied to the scalp twice-a-day for the rest of the individual's life in order to continue seeing results. It should be noted that it is not effective on the hairline. Many hair transplant doctors prescribe the use of Minoxidil to their patients to minimize the shedding that is often seen after the procedure â€“ called "shock loss". Side effects of using Minoxidil include itchy scalp, which is the most common complaint of users. Other possible side effects are an initial increase of hair loss, swelling of the face and extremities, lightheadedness, cardiac lesions, rapid and irregular heartbeat, and other heart irregularities. Patients should read the label or consult their doctor for a full side effect profile before using Rogaine.